There probably isn’t a tougher category than Original Screenplay, as our divisive rankings show. The top four contenders aren’t just all possibilities here, they’re also all legitimate contenders for Best Picture and looking at the recent trend of Best Picture winners, it’s a screenplay win that is its closest ally. This is an extraordinarily loaded category in that there are so many ways it could go. In one corner we have the overwhelming critics’ favorite Get Out, which managed to win lots of those awards even when the film didn’t. It has 26 wins; 16 in Original Screenplay, 10 from groups that only designated one Screenplay award. But then it was snubbed at the Golden Globes (and also in Director). It landed a BAFTA Original Screenplay nomination but was snubbed in Film and Director. Come Oscar nomination morning it earned just four; not a strong Best Picture possibility. But it’s a socially relevant and zeitgeist of a script that voters glom on to. Lady Bird has a similar trajectory with some critics’ wins for its screenplay but it actually got in at the Globes. It didn’t win but it did win Best Motion Picture – Comedy or Musical and Best Actress – Comedy or Musical. It suffered the same fate as Get Out at BAFTA though – getting in Original Screenplay but shut out of Film and Director. It’s gone home empty-handed since, winning nothing at Critics’ Choice or the Screen Actors Guild. It has five Oscar nominations and would need to pull out a big surprise here (which it could). With a year so heavily focused on women, that could be the tipping point for Greta Gerwig and her coming of age story. Three Billboards Outside Ebbing, Missouri has earned a small handful of screenplay awards from critics, but in the age of its backlash and controversy, it’s the screenplay that’s the most problematic. The Academy has rewarded scripts filled with racist, homophobic and misogynistic dialogue played for laughs before (Quentin Tarantino has two) but are we in a new era? I think we are, and the Directing snub for Martin McDonagh is rather telling. 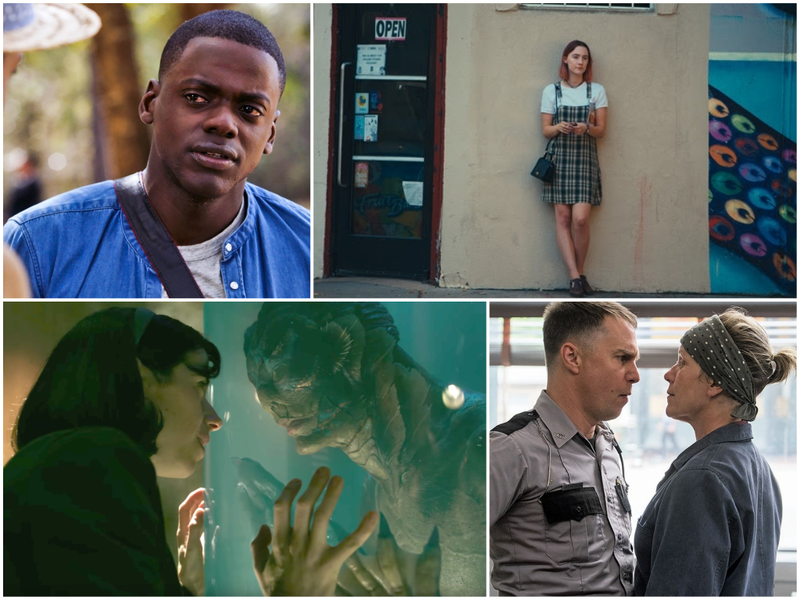 The Shape of Water won PGA and is the heavy favorite for DGA and is our (and many pundits’) Best Picture and Best Director frontrunner, yet it sits in fourth place. How can that be if screenplay is the practically a must for a Best Picture triumph? The Shape of Water has only one critics’ award for its screenplay and writer/director Guillermo del Toro has been faced with two claims of his story being too similar to some pre-existing material, including one outright accusation of plagiarism of his story. Like Three Billboards, this is information coming out after nominations but before Oscar winner voting and depending on how serious people take these controversies could tip the balance significantly. I feel bad for The Big Sick. It’s the film only nomination (despite also hitting PGA and SAG) and it’s got no shot here. But, at least it’s nominated and deserved it. The key could be the Writers Guild of America. Despite their myopic eligibility rules (that precluded Three Billboards from being nominated there), the winner there might give us the best piece of the puzzle. Let’s take a look at WGA Original Screenplay winners since the Best Picture expansion; what they won leading up to that win and how it impacted the Oscars. A couple of things stand out here for me. The Grand Budapest Hotel completely dominated the screenplay wins right up to the Oscars before Birdman snatched it away, just as it pulled a Best Picture win out of Boyhood‘s hands. That still stands as one of the great examples of the Academy completely acting out on its own. But, Birdman won SAG, PGA and DGA so it wasn’t so much a surprise, just that the guilds told a different story than what preceded it, much like The King’s Speech in 2010. Zero Dark Thirty suffered a major controversy that, while it earned an Original Screenplay nomination, found itself snubbed in Best Director. Just like Three Billboards. That Inception win at WGA still makes no sense. But, with The King’s Speech not eligible there who knows how that would have turned out. It likely would have won. Here are the Original Screenplay winner predictions from the Gold Rush Gang for Thursday, February 1, 2018.